Thank you for taking the time to visit our proposals for the new Office and Warehouse building within the former site of Building 84. The proposals are for a high quality and contemporary scheme, designed to compliment the range of developments coming forward in the town. We would be delighted if you would like to show your support by commenting on the proposals today, or on the East Hants District Council (EHDC) website when it appears later on this year. The proposal consists of a 100,000 sqft warehouse, 30,000 sqft of contemporary office accommodation, 142 car parking spaces, 25 cycle parking spaces, a goods yard that supports 8 HGV level access loading docks and further facilities of LGV and van loading and unloading. 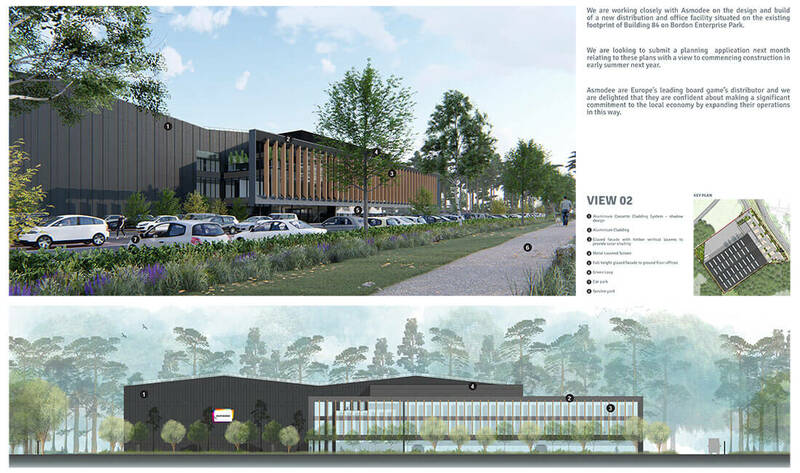 The concept is to create a high-quality working environment that sits comfortably in the heavily wooded surrounding environment, offering employees opportunities for walking and cycling to work, outdoor breakout spaces and rest areas and a range of other facilities to ensure the wellbeing of all staff. 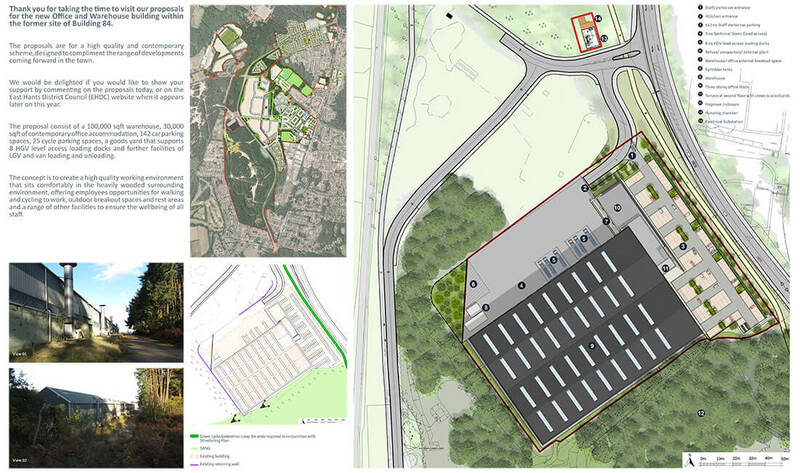 We are working closely with Asmodee on the design and build of a new distribution and office facility situated on the existing footprint of Building 84 on Bordon Enterprise Park. We are looking to submit a planning application next month relating to these plans with a view to commencing construction in early summer next year. Asmodee are Europe’s leading board game’s distributor and we are delighted that they are confident about making a significant commitment.